The only breast cancer recovery program designed by a Harvard doctor and survivor and approved by the American Council on Exercise (ACE) Feel healthy again. Regain control of your life. Exciting new research reveals that regular exercise can reduce the chance of breast cancer recurrence and extend your life. Exercise can also help you recover energy, strength, and flexibility diminished by lifesaving breast cancer treatments. 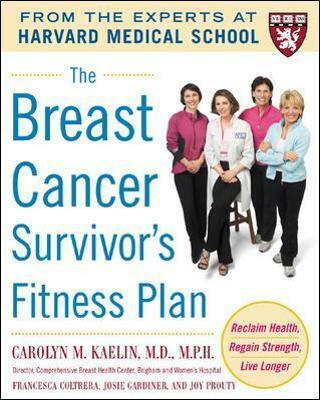 Dr. Carolyn Kaelin is a leading breast cancer surgeon who understands the important links among exercise, recovery, and the quality of life–and she is a breast cancer survivor, too. Designed with master trainers Josie Gardner and Joy Prouty, The Breast Cancer Survivor’s Fitness Plan features effective, inspiring workouts tailored for each type of surgery and adapted for differing fitness levels. Feel strong again and Improve your flexibility and balance Rebuild your muscles Protect your bones Enhance your appearance, vitality, and all-around health For more information on Dr. Kaelin about breast cancer treatment and recovery, read her award-winning book Living Through Breast Cancer.